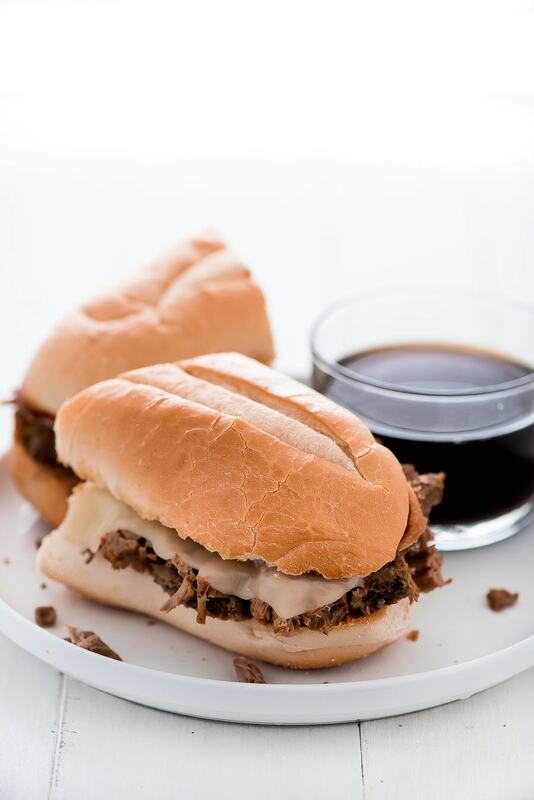 There are a few foods that will forever remind me of fall- Moist Pumpkin Bread, Texas Chili, and these French Dip Sandwiches. They are the perfect sandwich to eat on a cool crisp day. That warm crusty bread wrapped around that delicious slow cooked beef and melted cheese is heaven. 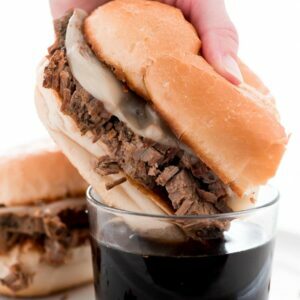 And of course, you must serve it with au jus- it’s own juices. No need to bring out another pan and make a separate sauce. 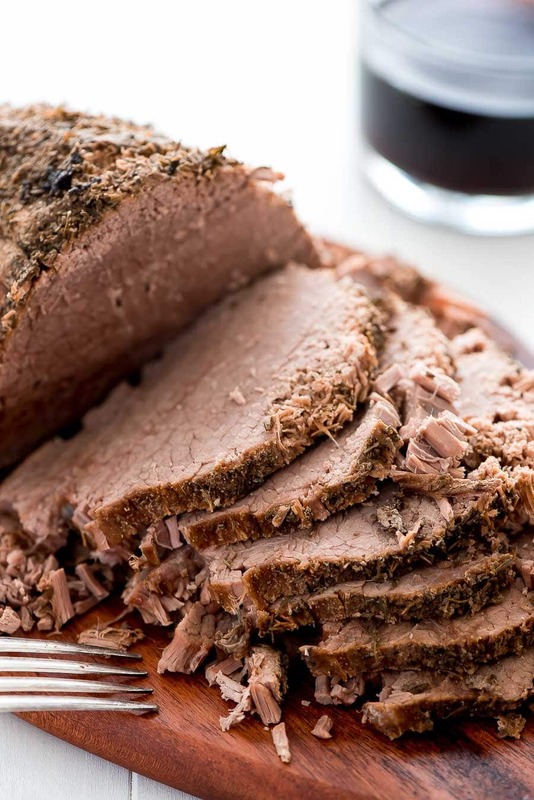 It’s made from the meat, broth, and seasoning you put into the slow cooker at the beginning. Before you take each bite, dip that big fat sandwich in your little cup of broth so that the crusty bread soaks it up and gives the sandwich even more flavor. Since you are dipping the sandwich in broth, it’s important that the bread you are using is a good quality sturdy bun that you get from the bakery, not a soft hamburger bun/roll. Believe me, you don’t want your bread disintegrating and falling apart as you eat it. 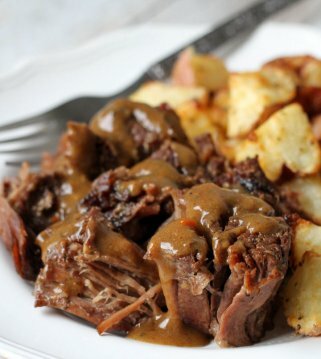 This is so easy to make, thanks to your handy dandy slow cooker. You throw in the beef, broth, soy sauce, water, and spices and let it cook for 6-8 hours or until a fork can easily pierce it. Then you slice up the meat and strain the au jus to serve with it. Sure you can just toss the meat right onto the bread but I like my buns toasted. Just spread some butter on those buns and broil them until they’re nice and toasty. Place some of the beef on the base of each bun and then top it with cheese… because why not?! Pop it back in the oven until it melts and close up the bun and serve the sandwich with the au jus. Easy and so good! Perfect for a busy day. Enjoy! 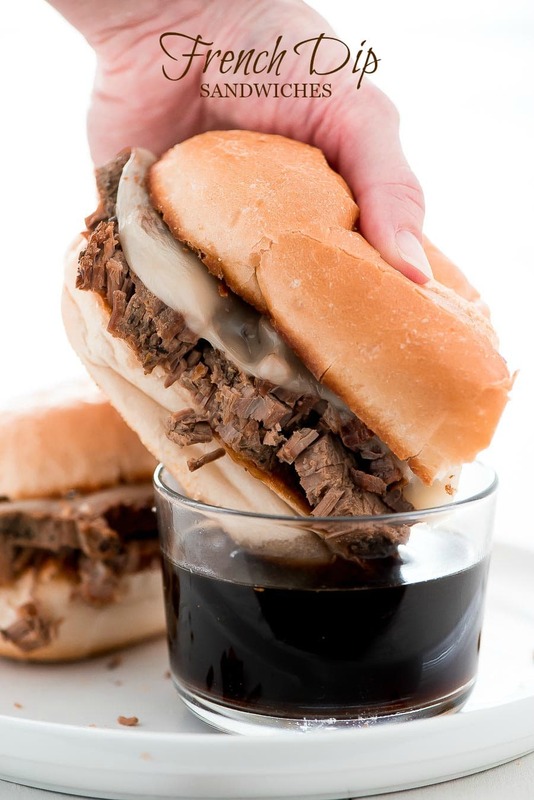 This French Dip Sandwich recipe includes hearty beef, melted provolone cheese, on a buttered toasted bun, and dipped in au jus. 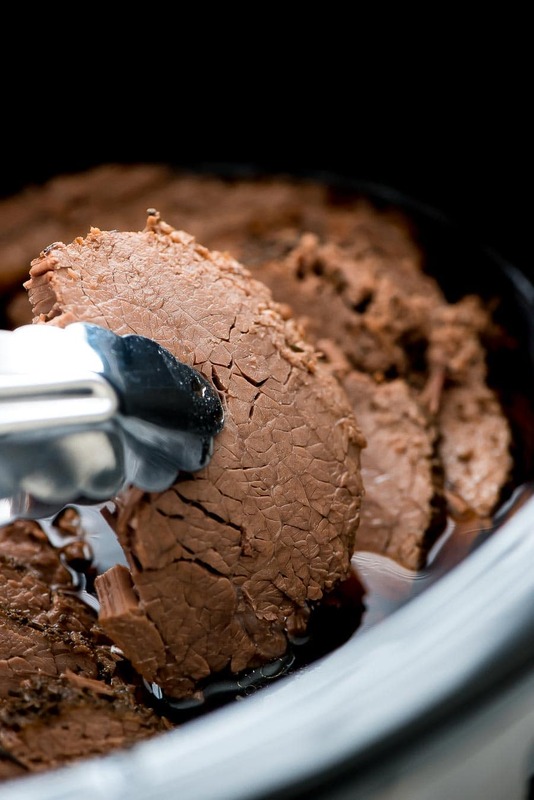 Place roast in the slow cooker and pour water, beef broth, and soy sauce on top. Sprinkle with the spices, toss in the bay leaf, and cover. Cook on low for 6 hours. Remove from slow cooker, slice, and place back in broth and cook on low 30 more minutes. Place meat on a platter and strain all the broth into a bowl to serve with sandwiches. Cut the buns in half. Spread butter on the inside of each half and place on a baking sheet. Broil of 1-2 minutes until lightly toasted. Turn oven to 350. Set the top buns aside, leaving the bottoms on the pan. Place meat on buns and top with cheese. Place in oven for 3-5 minutes until cheese begins to melt. Remove from oven, close bun, cute sandwich in half, and serve with au jus. This looks so mouth-watering!! 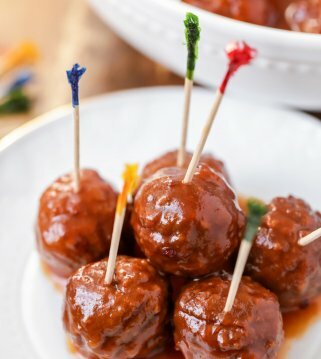 Thank you Melanie for sharing this recipe! 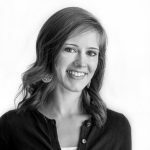 For more delicious recipes from Melanie, head over to Garnish & Glaze. Do I have to sear the meat before it it goes in the crockpot? 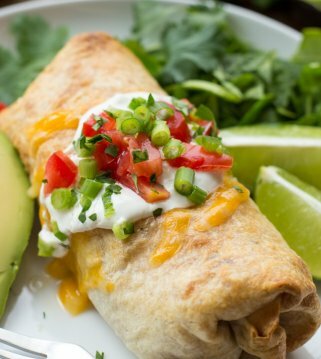 Your recipes look so good, even I can make. Will be giving several a try. I hope you do!! I’d love to know what you think 🙂 Thanks so much!